The last five years have seen major developments in China's home-grown military hardware and technical expertise, as Zhao Lei reports. The period since the start of the 12th Five-Year Plan (2011-15), has seen China make a number of remarkable achievements through its military modernization drive, and the People's Liberation Army now owns some of the world's best weapons, according to experts and observers. "Since 2011, China has been testing two fifth-generation stealth fighter jets, an accomplishment most of us didn't dare to think about 10 years ago," Wu Peixin, an aviation observer in Beijing, said. "With their development proceeding rapidly and smoothly, the PLA Air Force will soon have one of the world's top fighter jets." The aviation industry has enjoyed a golden period after decades of unpublicized efforts in research and development of basic technologies, materials and techniques, he added. In January 2011, China conducted the first test flight of the first prototype of the J-20 stealth fighter jet, becoming only the third country to develop and test-fly a 5G stealth combat aircraft after the United States and Russia. Less than two years later, the country tested its second 5G stealth fighter, the J-31, once again stunning observers, as few people at the time believed that China had the ability to develop another 5G combat aircraft. In September, the latest J-20 prototype appeared at a test facility owned by Aviation Industry Corp of China, which is developing the two aircraft, and made a number of test flights. 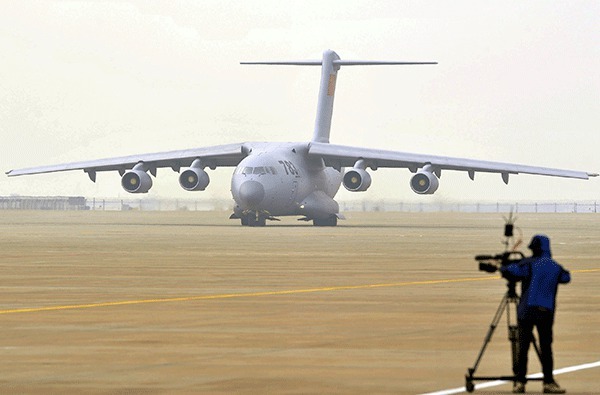 The tests led to speculation that engineers at AVIC, the country's leading aircraft maker, are finalizing the development of the plane, and that it will soon be delivered to the military. In November last year, the J-31 made its public debut at an air show in Zhuhai, Guangdong province. Although there have been no signs that the PLA has decided to procure the jet, its existence offers a wider range of options to complement the J-20, Wu said. AVIC plans to pit the J-31 against the US-made Lockheed Martin F-35 Lightning II in the international market, Wu added. In the past five years, the PLA Air Force and PLA Navy have commissioned a number of advanced support aircraft, such as the KJ-500 airborne early warning and control aircraft, the Y-8J maritime surveillance plane and the Y-8GX8 electronic intelligence aircraft, substantially improving the PLA's capability in information processing and electronic warfare, according to Wang Ya'nan, deputy editor-in-chief of Aerospace Knowledge. "The deployment of these electronic-operation aircraft is helping the PLA to build a unified information platform capable of integrating and coordinating combat aircraft and ground weapons, as well as naval hardware," he said. Gao Zhuo, a military observer in Shanghai, said the last five years have seen China introduce world-class tanks, multiple rocket launchers and ballistic missiles to its ground forces. Since 2011, the CJ-10A cruise missile, the DF-16 short-range ballistic missile, the DF-21D medium-range, anti-ship ballistic missile and the DF-26 intermediate-range ballistic missile have all been put into service with the PLA Second Artillery Corps, the country's de facto strategic missile force. Gao said the new missiles feature a range of cutting-edge technologies in their engines, materials and guidance and homing systems. He added that the combat ability of the PLA Ground Force has received a major boost, thanks to the purchase of the Type-99A main battle tank, the ZBD-04A infantry fighting vehicle, the HJ-10 anti-tank missile, the PLZ-05A self-propelled howitzer and the WZ-10 attack helicopter. "The combination of these weapons has turned the PLA Ground Force into an army that has no rival in Asia," Gao said.